India is projected to grow to a USD 6 trillion economy by 2030. As the country grows, consumption will also expand. Balancing the aspirations of a growing nation with sustainable development will be an increasing challenge that the Government would have to address. Chemistry has answers to several of these challenges. A booming chemical sector can place India amongst the front runners in manufacturing, technology and innovation and also contribute to the achievement of national priorities such as Swachh Bharat, Smart Cities and Make in India. 12 out of 17 United Nations Sustainable Development Goals would not be possible without chemicals. To improve the perception and spread awareness of chemicals in our everyday lives, CII is running a ‘Chemistry Everywhere Campaign’ which is currently in its fourth year. The campaign endeavors to bring together various stakeholder to build a thriving Chemical Sector in the country. 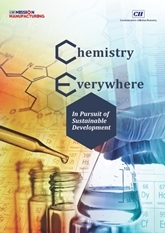 As a part of the Chemistry Everywhere initiative, CII has brought out a compendium on the Indian chemical sector entitled 'Chemistry Everywhere : In Pursuit of Sustainable Development’. The Compendium showcases the role and criticality of chemicals in day to day life and its contribution to economic development. It is an endeavor to communicate the many positive aspects of chemistry which are supporting the well-being and growth of individuals and nation. It is a compilation of testimonies from Industries across sectors, who have leveraged research and innovations to use chemicals in a responsible way, thus promoting sustainable manufacturing. The Compendium was released by Shri Rajeev Kapoor, Secretary, Department of Chemicals & Petrochemicals during the Conference on Chemistry Everywhere - “Energizing Make in India through the Chemicals & Petrochemicals Industry”, held on 28 November 2017 in New Delhi. 15% discount on purchase of 3 or more copies. You may like to buy copies of this compendium for reference, at your various office locations. On the purchase of bulk numbers (100 or more nos. ), your company’s logo will be printed on the cover flap of the Compendium which can be distributed to your business associates. For bulk orders we are also offering a discount of 30%.